If you want to configure a machine’s TTM Daemon to use settings other than the default ones, you can configure these values using the Daemon Setup dialog box in Guardian. The following procedures assume that you configure a TT machine that communicates over a LAN. If you need to configure a machine for a remote connection, refer to Configuring the Remote Client. By default, TTM listens on port 10200. On the machine that hosts the TTM Daemon you want to configure, open Guardian (in the system tray double-click the TT icon). From the Config menu, click Daemon Setup. The Daemon Setup dialog box appears. In the Local Daemon section (on the left side of the dialog box), edit the contents of the Port box to that of the appropriate port number. By default, TTM communicates over the primary NIC. 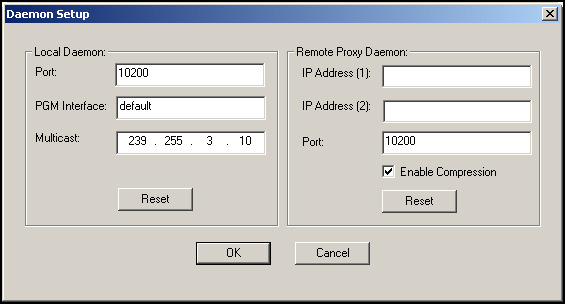 In the Local Daemon section, edit the contents of the PGM Interface box to that of the secondary IP address. When using TTM, if you incorrectly enter the address of a NIC, the TTM Daemon defaults to the primary NIC. By default, TTM sends multicast over the address 239.255.3.10. If you use a multicast address other than the default, you must change this address in Guardian on all machines that reside on the network segment that uses this address. In the Local Daemon section, edit the Multicast entry to that of the new multicast address. All changes are written to the ttmd.cfg file.